vanilla pods mixed with honey. Sounds delicious. 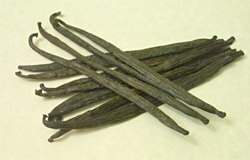 Attempts were made to grow vanilla outside of Mexico by the French beginning in 1819 in their Indian ocean territory of Reunion, however, because the vanilla plant which is in fact an orchid, is normally pollinated by a particular bee in Mexico these attempts failed to create the seed pods necessary to produce the spice. It was not until 1841 that artificial pollination of the vanilla orchid was discovered and successful cultivation became possible. Most of the world's vanilla is grown in Reunion, The Comores, Madagascar, French Polynesia, Fiji and Tonga. Vanilla is widely used to flavour foods and drinks including Coca Cola and is very popular in perfumery in both its natural and synthetic forms. Natural vanilla is superior to the much more common synthetic vanilla and once you have tasted "real" Bourbon vanilla bean ice cream which is pale straw in colour, rich in butter fats and contains tiny black flecks from the vanilla seeds I am sure you will agree. The perfect accompaniment for a Tart Tartin or for making Jim's favourite, Affogato al Cafe. An affogato is simplicity itself. Place a generous scoop of fine quality Bourbon vanilla ice-cream in a glass and pour a hot double espresso coffee over the top. Eat it with a spoon and enjoy the way the bitterness of the coffee marries with the cool, creamy richness of the vanilla ice-cream.